When I checked my email last night, there was a message from my older brother that my mother had a slight stroke overnight. As soon as I read it, I called him to get further details. He said the staff at the nursing home felt they could take care of her and that moving her to a hospital at her age could be more harmful than helpful. He planned to visit her today and said he would email a report on her condition. I just read his email. At this point, my mother cannot speak and has no use of any part of the right side of her body. My brother said that it looked like she wanted to tell him something, but couldn't. Those of you that are not fulltime RVers, may not appreciate how a normal shower can truly be a pleasure. When I shower in the motorhome, I turn the shower on to get wet all over. Then I turn off the water to soap up, before rinsing off. Next, turn the water off to shampoo my hair, and then rinse once again. I do this for two reasons...I have a limited supply of hot water, and I need to keep the moisture level down inside the rig to avoid the possibility of mold. I do run an exhaust fan while showering, but it makes the soaping up times a little brisk (especially in winter!). There is a shower in the community building, but I haven't used it until today because the fire guys that live in trailers here use it and leave all their towels and soap, etc., on all the bathroom hooks and inside the shower. That kind of gets on my last nerve. They left town for the holidays last Thursday, but all their crap is still in the bathroom. Each site alternates cleaning the building each week, and when Anne cleaned this week she moved all their stuff to the second bathroom that doesn't have a shower. So, today I basked in the luxury of taking a shower without having to turn the water off several times. I'd sort of forgotten how nice that can be. It's been a while since I had that option. When I use a community shower, I carry in my soaps and towels and shower shoes, and carry them out again when I'm done. These young guys need to be a little more thoughtful about their actions. (including putting the toilet seat down ;)) You can be sure I will mention it to them when they return. Sorry about the little rant, but they are supposed to be adults and I'm not their mother! Since the sun was shining and I had the day off, I decided to take a drive to see some of the effects of hurricane Ike on the Bolivar Peninsula. The peninsula is like a barrier island separating the Gulf of Mexico from Galveston Bay. The Bolivar Peninsula is just south of Anahuac NWR property. Galveston Bay borders the southern boundary of the refuge. While most of the debris has been cleared by now, there was still evidence of the devastation in the area. Of the 8700 homes on stilts on the peninsula, only 1800 weren't wiped out. Most of the businesses were not on stilts, but built on the ground. The result...just about all businesses were flattened, like this True Value Hardware Store. Other than a rebuilt doughnut store, there really isn't anywhere to eat out anymore. The Stingeree Restaurant, where I have gone in the past, will re-open on Wednesday. This is another of the shredded homes that I saw. You can't keep these peninsula people down for long. New homes are being built once again. The difference that I could detect is that the stilts are made of steel as opposed to wood. I'm not sure that will make a noticeable difference should another hurricane with the force of Ike hit, but then I'm not an architect. One of the few businesses that was open was an auto repair shop. I decided to stop to see if I could get an oil change on the Focus since it was within three miles of being due. To say they were happy to see me was an understatement. There were three mechanics standing around just waiting for some business. Since Ike, their business has been cut in half. The wife (and co-owner of the shop) worked the office, and we had an interesting chat while the guys worked on the car. I learned that when they were told to evacuate, she and her husband only took their computer and two days worth of clothes. She said they were not told how bad the storm would be. They had boarded up their home and business, but left everything, including their fifth wheel, behind. They expected to be back in a day or two. As it turned out, they weren't allowed back for two weeks, and had lost everything. When they returned, the battle with the insurance companies began. She was pretty bitter about how they were treated by the insurance people. She was also sad about the loss of trees and owls. The local Audubon Society is giving all residents free trees to plant on their land. The shop has twenty acres, so they were given fifteen trees. She misses the owls, and felt that is the reason for the horribly large number of mice that are now everywhere on the peninsula. Who would guess that a hurricane would cause an explosion in the rodent population? Many of the customers that they now get come in with complaints about their vehicles that turn out to be caused by the mice chewing the wires in their vehicles! Wow, that was an informative 15 minutes I spent getting the oil changed. Both owners thanked me for my business and wished me a Happy New Year. I'm glad I could contribute a little to the recovering economy of Crystal Beach. After visiting Arches National Park in Utah in September, 2008, I headed southeast into Colorado to spend three days at Mesa Verde National Park. After spending about 600 years living on top of the cliffs, the Ancestral Puebloan people began building their villages under the cliffs. They still farmed the mesa tops, but lived below. They lived in these cliff dwellings from about 1190-1270. Mesa Verde (green table) NP contains some of the largest and best preserved of these dwellings. This is Cliff Palace, one of the larger dwellings. This is a portion of the Long House ruins. I don't remember the name of this dwelling, but they were all fascinating to me. I took a half day ranger led tour while I was there, and felt it was well worth the $50 cost. I was happy I had made reservations at the park campground, as there weren't any empty sites. The cost was just under $33/night, but that did include water and electric. I didn't qualify for an Interagency Senior Pass at that time, so I paid the full price. After leaving Mesa Verde, I slowly made my way to Albuquerque to check off an experience on my bucket list. Stay tuned next Sunday for that blast. It got down to 37* last night, and that's what the temperature was inside the VIS when I arrived this morning. There is one little electric space heater, but it took until the middle of the afternoon to heat up the area so I could take my gloves off. Granted, I get cold easily, but just sitting inside there on a cement floor makes a slow day very long. I had a total of eleven visitors, but did do $165 in sales. I guess the sales make it worthwhile for the Friends group, but it's rather boring for the person working. I had at least hoped to try to get another chance to get a picture of the vermilion flycatcher, but I didn't even see him until it was time to close. I was afraid that he had been blown away during the severe winds on Thursday. It's raining a little again this evening (what else is new? ), but hopefully it will be sunny tomorrow. I will be arriving at the VIS by 6:30 tomorrow morning to participate in the Christmas Bird Count. At this time of the year, tens of thousands of birders participate in Christmas Bird Counts across the USA, Canada, and Mexico. The statistics from these counts have been accumulated for at least 50 years. The count areas are designated circles with a fifteen mile diameter. All birds seen or heard in these circles are counted during a 24 hour period. I hope all of you had an enjoyable holiday. It was a quiet day here on the refuge. Three of us enjoyed a tasty baked ham dinner. Shortly before five this morning, I was rudely awakened by thunder, lightening, a deluge of rain, and winds so strong I felt like the rig was going to roll over. I literally jumped out of bed, and in less than three minutes, I rearranged things and brought the slide-outs in! Then Emma and I sat in the living area and watched the news. What else can you do at five in the morning? Actually, I was surprised that I still had electricity. It seems anywhere I've been that the electric goes out with a storm of this intensity. Eventually, the front moved through, the rain abated, and the skies cleared. The wind, however, continued to blow at an average of 32mph with gusts much higher. I had to make a decision....do the salinity tests and bird survey today, or try to get it done tomorrow morning before starting to cook for our Christmas Dinner at the RV pads. I decided to get it done today, so off I went. I have two places that I stop to do the salinity tests, and this is the first one. I hope you notice the muddy conditions. I donned my rubber boots, stuffed the salinity meter into my pockets, grabbed my walking stick for stability, and began the challenge of sloshing through the muck and mire. This is the view looking back through the mud that is spiced with plenty of cow pies. :) A fragrant and boot sucking trek to say the least. This is where the cattle drive, that I posted pictures of last week, ended up. The cows had moved off to another section, so at least I didn't have to deal with them up close and personal. Once I got to the culvert that has locks (as in water locks, not combination/key locks) on it for increasing/decreasing water flow, I took out the salinity tester. It measures salinity in parts per million. My job is to submerge the sensor to several inches above the bottom to get a reading. Today, the reading was 4.4; last time it was 3.3, so things do change. After I tested in four locations, I drove to the Shoveler Pond Loop to do the bird survey. Since the hurricane, there has generally not been much to see on the loop bird wise. I thought it might be a little different this afternoon because of the high winds. The slightly inland location of the loop would afford some protection from those winds. I was right! While the variety and number of birds was not astronomical, it was probably the best count for this year. It took me two hours to do that 2.5 mile loop. I'm really glad that I did the tests and survey today so I can just enjoy the holiday tomorrow. The winds are still blasting away close to 40 mph, but they're supposed to subside to around 20 by 9:00. Maybe these conditions will keep the rodents flying past the rig tonight???? This afternoon, I headed for the main part of the refuge to patrol the roads for litter. Some volunteers don't like picking up litter, but I do. The reason I like it is because I'm outside and can enjoy the wildlife while I'm working. I was driving my official refuge vehicle and decided to start with the route around Shoveler Pond. I had noticed quite a bit of litter there last week, but apparently someone else had picked it all up. I headed down the road to the boat launch on the bay. This is where many fisherman go. There is never a lack of beer cans, bait containers, and other junk that has been tossed along the road. I don't understand why fishermen (and women) can't take their trash with them. Anyway, I stopped numerous times to get out to gather the trash. As I tried to slow for more garbage, a light started flashing on the dash and an alarm was sounding. I couldn't stop...NO BRAKES! Thank goodness this happened on a refuge road and not on FM1985! I don't even want to think about the possibilities of what could have happened on that road where the truckers go about 80 mph. I turned around and cautiously headed back to the shop only to find that the gate was closed and locked. I have a key to get in, but the problem was that a closed gate meant no one was is the temporary office area or the shop. I had noticed that Chuck, the staff that takes care of all the vehicles, had left the refuge around noon. Now what do I do? I didn't want to try driving the ten miles back to the rigs on FM 1985. I had passed John, the refuge assistant manager, on the road, but was unable to stop to flag him down. Thank goodness, I carry an emergency phone list for the refuge in my fanny pack. I called John, and he was able to return to the shop and get a different vehicle for me so I could get back home. Now I'm driving a ten passenger van around. That's really overkill for what I need, but at least the brakes work. Before the brakes gave out, I was able to get a few shots around Shoveler Pond. One of the few survivors of the hurricane was out sunning himself. This big boy or girl was about eight feet long. You can estimate the length of an alligator by looking at its head. The distance between the nostrils and eyes, in inches, converts to how many feet long the gator is. I also spotted a Roseate Spoonbill quite a distance out in the fresh water marsh. This one wasn't very rosy, so I guess it hasn't been eating too many shrimp, which produce the reddish color. 'Tis the season to eat tasty foods. I finally decided to make my corned beef today along with potatoes and cabbage. Just as I was dishing it up, Sonny, the staff member that does the hunter check station, banged on my door and invited me up to the community building for some holiday cheer. I graciously declined and told him I was just sitting down to eat. After that tasty meal, I decided to go up to the building for some socializing. It turns out that Sonny had made Oysters Rockefeller with a great bunch of oysters he had taken from the bay. Well now, I've never eaten an oyster in my life! After a little harassment from the others, I decided to give it a try. I only ate one since I had just had a big meal, but it was quite tasty. Sonny's recipe called for a combination of cheese, bacon, oyster, spinach, and Worcestershire sauce. It was served on the half shell and made a pretty presentation. This is the six o'clock report from the front lines of the great rodent war. After initially disposing of one dead body a few days ago, things were fairly quiet. I was still hearing some scratching noises, and Emma would jump up and rush over to the refrigerator several times in the evening, but my traps remained empty. I had put some additional sticky traps in the outside storage areas and on the kitchen counter, but I couldn't entice any furry critters to visit them. So, today I went to Lowe's in Baytown, TX, to get a new electric space heater. The one I have in the front of the rig has been acting funny recently, and I thought I should replace it before something unfortunate happened. I've used it quite a bit in the last three years, and I'd rather be safe than sorry. While I was at Lowe's, I checked out their mouse traps and was finally able to find the kind I'm comfortable with. I bought four more of them. When I got back to the rig, I heard mouse type noises that seemed to come from under the shower. Under my refrigerator, which is next to the shower, I have a long shallow drawer that I keep all my tin foil, baggies, and plastic wrap in. I decided to pull that drawer out to see what was underneath it. As I pulled it out, it was obvious that this was a favorite location for my adversaries. P.U.!!!! I didn't need to see the evidence, I could smell it. I loaded up a trap with peanut butter and put it under the drawer on the floor. It is behind a portion of the lower wall where quite a few electrical wires are located. Within 30 minutes, I had caught two mice. Aha...maybe I'm making some headway. YUCK...I hate meeces to pieces! As if the mouse problem isn't enough, I had another surprise this weekend. When I wake up in the morning, I look out the window at the head of my bed to see what is going on with the weather. Yesterday morning, about 6:30, I looked out the window and noticed a huge spray of water going up and out from my hose connection. The small ditch to the east of the rig was full of water. Sometime during the night a hole had blown out in the Y connection that the hose was attached to. I scrambled to get outside and turn off the water. That connector and hose belong to the refuge and have been in place for several years. The fire guys couldn't get it off when they moved the refuge trailer off of the site last week when I moved over here. The connection was so corroded, that it was impossible to unscrew it. Of course it was Sunday, so no one was working on the refuge. Luckily, I had about 12 gallons left in my fresh water tank from my travels. Nathan, the maintenance guy, was able to replace the old corroded faucet today, so I'm back in business for doing dishes and showering. It wasn't a horrible experience, but just one of those little bumps in the road. I didn't hike any of the long trails this visit as I had in 1988. I also didn't take very good notes on the names of the arches I did see, so I'll just include a few pics. in order to get to the arch. I stayed at a private campground near Moab for a few days while I was there. The campground in the National Park is twenty-five miles into the park and does not have hook-ups. It was booked solid while I was there, so I didn't have a chance to experience camping there. Before I left, I made sure to have reservations for the next stop on my journey...Mesa Verde National Park in Colorado. I was on the road by 7:30 this morning headed for the VIS. Naturally, since it was a work day, the sun was shining and the temperature was slowly rising. I opened the building, started brewing the free coffee, put out the banner and waited for the crowds to arrive. OK, I knew there weren't going to be hordes of people, but I didn't think I'd have to wait two hours for anyone to show up. After the miserably wet week, I thought the birders would be arriving early on such a gorgeous day. I was wrong. Right in back of the temporary VIS is a small pond (the one that had all the frogs wiped out by hurricane Ike). Those black dots in the sky are starlings...ugh. It's a pretty little pond and the flycatcher likes to hang out around it. Eventually, the little dude showed up. This shot is better than the last one I took, but I'm still not satisfied. Of course, each time I got the camera set up, he decided to flit off to some other perch in his search for insects on the wing. I'm not giving up yet. I've got about six weeks left to get a better shot. By the end of the day, the grand total of folks that stopped in the VIS was 19, and I had $34 worth of sales. Not exactly the big time, but it sure beats being skunked all day like I was at Swan Lake NWR in Missouri last summer. I always enjoy talking with the visitors, and I had two fellows that were repeats from last weekend. One is an English chap who kindly noticed that I wasn't Colin. :) The other was a fellow from about eighty miles away that has never been out of the state of Texas. He was astounded to learn that I drive my rig by myself and travel around the country alone. I told him I am one of many, but he just couldn't believe that a good looking, bright woman (his words) like me would travel alone. He should have stopped there with the flattering comments, but he didn't. He went on to say...surely, there's some old geezer out there with the same interests that you could hook up with! Oh boy! I reminded myself that he was a visitor and remained pleasant. I'm sure he'll be back with more words of wisdom in the future. When the sun rose this morning, you could actually see it! I headed in to the shop to help one of the staff members clean up the sign area in the loft of the shop. My guess would be that there are enough signs in storage to last about fifty years. These signs are mostly road signs like speed limits, detours, no hunting, Nat'l Wildlife Refuge boundary signs, and all kinds of curves, along with trail signs. Quite a number of them were recovered from the debris from Ike. We sorted through all of them and got the area organized. Some old signs were reusable, but others were really beyond use. I can honestly say that I've never done a job like this before. ;) We were also kept company by a number of mice scurrying around. This must be the year of the small rodent at Anahuac. Makes me think of the rise and fall of the lemming populations in the far north. I'm sure all the northern harriers and red-tailed hawks must be staying healthy with the wealth of food for them to catch. Do you more mature folks remember the body counts on the nightly news during the Viet Nam War? Well, we have our own version of the body count each morning as we compare notes on how many mice were caught in the traps overnight at the RV pads! Wouldn't it be wonderful if rodent engagements were the only kind of war our country had to deal with? After lunch, I headed over to the office, in the town of Anahuac, and worked with Stephanie all afternoon on the education programs. We were able to get the kindergarten program ironed out and began work on the first grade program. We have to make sure that what we do goes along with the Texas science standards for each grade level. Kindergarten students need to learn about their five senses, so we developed a station for each sense. Most stations are activity driven at that age, and I think we came up with some enjoyable learning experiences for the little people. Stephanie has the next two weeks off, so I won't be meeting with her again until the new year. The skies are supposed to clear overnight and no rain is forecast until next Tuesday. I sure hope the forecasters are correct. I have to work at the shop tomorrow, run the VIS (visitor's information station) on Saturday, and hope to finally do the salinty tests and bird counts on Sunday. That should allow for three days for the back roads to dry out some. Do you like rodents? I don't mind rodents as long as they stay in their natural habitat (read as outside my rig!). I bet you can guess what my battle is. Colin, the volunteer from England, told me he was trapping up to four mice a night in his trailer this past week. I hadn't seen any evidence in my rig, but I loaded up two traps with peanut butter just in case. Around 9:00 last night, Emma and I heard an unusual noise from under the kitchen sink. Sure enough, a little furry creature bit the dust. Later in the evening, Emma flew across the rig and dove under the steering wheel. I didn't see anything, but she's usually sound asleep by then. Hmmm....looks like I'll have to work more aggressively to overcome the onslaught. Toward that end, I looked for more mouse traps while I was out shopping this afternoon. I can't stand those wooden traps with the spring and lever. They just make me nervous to set up. I have two plastic traps that accomplish the same thing without a danger of "catching" my fingers. Of course, I couldn't find any of the plastic traps today, but I bought four glue traps instead. I hope they have improved the glue on those things. When I tried them about five years ago, I ended up with a pile of fur on the trap and a half bald mouse running around the house! Anyway, I'm going to put one under the hood of the motorhome and a couple in the basement storage compartments tomorrow. I will prevail! The other challenge for the day was to somehow get more heartguard pills for Emma. She is due to have one on the 17th, and I don't have any left. When I lived in Minnesota and New York, heartguard was only needed six months of the year. Now, I have to have Emma on them all year since I am seldom in an area without mosquitoes. I eventually found the vet where I took Emma when she first came to me (she was dumped on this refuge two years ago). I brought all my vet records along, and after calling the vet in Lago Vista, TX, they allowed me to buy another six month supply to the tune of $44. If I were in the Rio Grande Valley this year, I'd just go down to Mexico and get the same thing for $17, but since I'm not, I paid the price. The weather continues to be overcast and rainy with increasing winds from the north. There may be some sun by the weekend. I sure hope so. The fog the last few mornings has almost been thick enough to cut with a knife. This morning was no exception, and the heavy fog turned to rain in the afternoon. It was a good day for inside chores. I cleaned the rig from stem to stern, did the laundry, and exercised the generator. Once the rain stopped, it quickly heated and steamed up outside so that I was able to use the air conditioner to make sure the generator had a full load. That sure helped dry out the inside of the rig. With such high humidity lately, everything felt soggy. The warmer, wet temperatures have also brought out the mosquitoes full force. I am careful not to be outside at sunset. That's when they just cover the screens trying to get in. They calm down about an hour after the sun sets. Today's Blast will include more pics from Dinosaur National Monument. A few miles down the road from the Green River Campground, but still inside the monument, is the original homestead of Josie Bassett Morris. Josie was an intrepid pioneering woman who spent fifty years living on her small ranch alone. She came here from Brown's Park after having been married three times. This is her cabin which is surrounded by two box canyons. She planted a variety of trees around the cabin which are now very large and mature. She battled over water rights with a neighboring rancher. This is where I led my bird tours. The hikes into the box canyons are wonderful. On the drive to Josie's Cabin, several petroglyphs can be seen. Small examples of petroglyphs can be found throughout the monument. About A.D. 200 to 450, the native people here began to grow crops such as beans, corn and squash. So began the Fremont Culture. While these people inhabited the area, they produced many petroglyphs. Along the road to Island Park large panels of petroglyphs can be found on the rock outcroppings. Some people suggest that these large decorated anthropomorphs (human-like figures) depicts the taking of trophy heads or scalps, but no one knows. There is a trail to climb up to get a close view. Remember to bring a jug of water, as summer temps hover near 115*. The one thing I didn't do while at Dinosaur, was to take a white water float trip down the Green River through the monument. Many, many folks do this each summer, and usually each year there is a fatality, and the summer of 2008 was no exception. A twelve year old boy that we talked to at the visitor's center drowned when he fell out of his raft. The trips are run by private companies outside of the monument. I did such a trip with my family back in 1988, and we had a spectacular time. This young buck was a frequent visitor to the campground. The riparian habitat surrounding the campground meant that wildlife was quite abundant there in an otherwise high desert environment. Today was the day that the "Friends of Anahuac NWR" provided big pots of chili for the hunters on the refuge. The duck hunters must check in each morning of the hunt before they head for their favorite spots. They are a dedicated bunch, as they arrive on the refuge at four in the morning to check in. So, by about ten o'clock many of them are ready to leave, and they are certainly hungry. The Friends provide the chili as an outreach activity. They are all dressed in cammo, and this young man spent a lot of time fixing his face! I was happy to see so many young folks enjoying the out of doors. Colin, the volunteer from England, was working the visitor's center today. He will be heading back "across the pond" on Tuesday. I knew he'd enjoy having some chili, so I headed over there to relieve him so he could go to the hunter's check station for lunch. Not the usual visitor's entering the refuge. :) Ranchers lease certain areas of the refuge for grazing, and periodically have a cattle drive to move the herds from area to area. The cattle keep the marsh under control and fertilize as well. There are no bulls in this group, and the cows will give birth out on the marsh in the next month or two. I figured Colin got stuck behind the herd as it came down the entrance road and I was correct. There is no way to pass the herd, and it took him over an hour to come the last five miles. In hindsight (pun intended) he wished he had left the check station five minutes earlier. I was ready this morning by 8:45 to head out to do the salinity tests in the marsh and to conduct two short bird surveys. The wind was coming out of the north and the temps were trying to reach forty as we headed out. I'm sure glad I wore my winter coat, had knee high rubber boots on, and brought my gloves! The first salinity test spot was about 15 miles away and located just before one of the bayous enters the bay. The ranchers, that lease this area for cattle grazing, had installed an electric fence in the last week, so we had to walk through a gate and troop through 100 yards of mud to reach the test site. I had also brought one of my diamond willow walking sticks along, and it sure did help my stability through that quagmire. I learned the ropes of doing the tests. I'll take some pictures and give further explanation next week when I do it on my own. Because of the wetness in the marsh, there are only two sites that we can get to with the vehicle right now. If it dries out some, I'll have more sites to test. By the time we got back to the rigs, it was 1:00, and my stomach was growling for food. After lunch, I worked a couple of hours on the education programs. That's enough for today. I think I'll watch one of my netflix movies tonight. After lunch, I headed to the shop to turn in my present vehicle for the one I was supposed to have. It's a drive of about ten miles to get to the shop or visitor's center. After I got the switch accomplished, I decided to take a drive around Shoveler Pond and out to the boat launch. Surprisingly, I was able to see an alligator. Most of them died during the hurricane. As you can expect, I found a few of my feathered friends willing to pose. This is a neo-tropical cormorant. Cormorants dive for their dinner and must spend quite a bit of time each day drying out their feathers. Just look at those yellow dancing shoes he has on....a distinguishing feature. Today was the first time I have seen a wood stork on this refuge. I have seen them in Florida and at Laguna Atascosa NWR, but this was a first for me at Anahuac. I was able to watch one stork feeding. They put their beak down to the water and then swish the water with one of their feet to stir things up....a cool adaptation. I headed back to the moist soil units of the Skillern Tract and found an abundance of black-necked stilts working the shallow flats. I know this photo is awful, but I wanted to show you what I've decided will be one of my challenges while I'm here. I want to take a good picture of a vermilion flycatcher. This one has been hanging around the visitor's center, so I should get a chance to show you a better picture. Light rain continued throughout last night, but it stopped pretty early in the morning. That was a good thing, since the fire crew showed up to move the vacant trailer off of the paved pad so I could move over. With all this rain, the fire crew wouldn't be burning any of the marsh for a few days. They do prescribed burns at this time of the year to renew the marshlands and keep woody growth under control. Because of all the rain and cooler temps, (the rain doesn't have a chance to evaporate) the area in front of the paved pad was pretty soft. At one point when I was backing into the site, I wasn't sure I was going to make it. Those rear dual tires began to sink into the mush. Luckily, I was able to get it going after gunning it. Gunning this rig in reverse is not something I like doing, but it worked; I got the rear up onto the cement and it was smooth sailing (literally) after that. I avoided going into the ditch beside the pavement, but there's an awful lot of clay and mud coating all of the tires. The winds were blowing all day out of the south around 25mph. That brought the temps up into the seventies, and with the near 100% humidity, I was sweating bullets as I got the rig set up once again. Needless to say, with the heavy morning fog and rain, we did not do the bird survey today. It's supposed to be sunny for the next two days, so I'll be out and about looking for my feathered friends. After a brief interlude with the sun on Saturday, the rain has returned and deepened the quagmire outside my door. So far, the empty trailer across from me has not been moved, but I remain hopeful that I'll be able to move to pavement sometime this week. It turns out that the vehicle that I was assigned was the wrong one. I've kind of enjoyed using it since it was a law enforcement vehicle, and folks tend to slow down and behave on the roads when I drive behind them. :) But it looks like I'll have to trade it in tomorrow for a probably more beat up vehicle. That's OK with me since all kinds of warning lights have been flashing on the dashboard and the speedometer shows that, almost immediately upon moving, I'm traveling at 100 mph! Ha! Anybody that knows me knows that 100 mph is way faster than I'd ever drive. After doing my laundry this morning in the community building, I headed for the refuge office in Anahuac to pick up my mail and two Netflix DVDs. While I was there, I met with Stephanie and she loaded me up with plenty of educational program info for me to work on. I'll be able to work on developing the programs from home. I can certainly live with that! Sure beats sitting in a stuffy office some where. In June, 2008, I finally arrived at Dinosaur National Monument to begin a three month volunteer assignment. Three days a week, I worked in the outside visitor's center, and on Saturdays I lead bird tours. I was working on the Utah side of the monument which is a high desert environment. The Green River flows through the monument, and the public campground is located amongst those cottonwood trees along the river. There are three full hook-up volunteer sites there. The rest of the sites do not have any hookups. This was the view out the front windows of the RV from my campsite. Even though it is considered desert, because of the river and spring flooding, the mosquitoes were voracious. People from around the world come here to see the famous wall of dinosaur bones. The original visitor's center was located here in a building built around the bones to protect them from the elements. The only problem is that when the structure was built, the footers were not sunk down to bedrock. So over the years, the building started moving away from the wall of bones, and a few years back the building was condemned. So, when visitors come, they can no longer view the wall. That is why the visitor's center was located outside while I was there. This gig was a lesson on how to deal with upset visitors. Many of them didn't know the quarry was closed, and had traveled great distances to get to the monument. We did offer a hike in the mountains led by the rangers to see some dinosaur bones, but some people could not go on it since it involved a trail that is not paved and temperatures were commonly near 115*. I decided to put out a hummingbird feeder to see if any birds would come. I was astounded at the numbers that came to the feeder. I even bought a second feeder, put that out, and really had to work to keep them filled. I went through about a half gallon of sugar water a day! 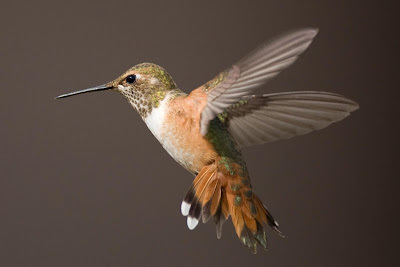 I wish I could take credit for this shot of a male rufous hummingbird, but I can't. There was a young man camping along the river that asked if he could spend an afternoon at my site photographing the birds at the feeders. I told him he could if he emailed me a picture, and he did.